Research shows families who spend time outdoors in nature are healthier, happier and smarter. Plan your outdoor adventure so that it is fun, safe and memorable. Good planning can make or break your family's outdoor experience. Expect to stop often to look at small things that may draw a child’s attention. Keep trips short in the beginning and build on each experience. A child’s stamina is not the same as an adult, so keep nature walks and hikes fairly short. Know that children ask lots of questions. You might not know the answers. Treat these as opportunities to learn together. Expect a child’s interests to be different from yours. Be flexible with your agenda. Let children know what to expect before you start. 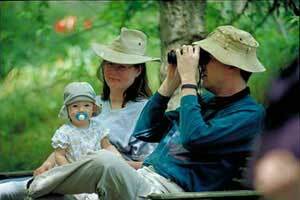 Prepare them for activities at your destination- hiking, swimming, fishing, hunting, playgrounds, wildlife watching. Prepare them for the journey: transportation, stops, weather. Let them know you have snacks, water and a meal plan. The more children know what to expect, the calmer they are during new experiences. Make a plan - let someone know where you'll be and when you plan to return. Keep kids within sight or hearing distance at all times. Dress in bright colors. Wear layers of clothing, to adapt to changes in weather. If you walk or hike with young children, stay on established trails. Note the time you start walking to gauge how long it will take to return. Know how to get help in an emergency. Take a cell phone and a trail map. Consider bringing a whistle. Bring an updated first aid kit. Find nature nearby at Nature Rocks Texas. Carry water for yourself and your kids. Ask parents about any food allergies. Pack out what you pack in, even fruit peels or rinds! Even biodegradable waste products do not belong in many natural habitats and can hurt wildlife. Snack in the shade, or in other spaces that will interest children, once they finish eating. You don't need to be a scientist, a "naturalist" or a true expert in outdoor skills to enjoy nature while you hike, fish, hunt, boat, or picnic. Young children discover the world closest to them in physical ways. Things at their eye level and on the ground hold greatest interest. You can help them discover the world above their head, too. Just look around! Wildlife excites children. Help them enjoy it. Approach with caution, and observe quietly. Let them ask questions about what they see. Ask children to think about how animal bodies are designed to help them survive. Do they have big ears to hear predators? Do they have big round eyes to see better at night? Do they have claws to climb trees or dig holes? Do they have tricks like possums, who play dead, or armadillos, who ball up? Ask children to think about what type of camouflage animals use. Does their fur match the color of the grass in the fall? Does a bird’s feathers look like the trees they sit in? Does the pattern of a moth’s wings look like owl eyes? Wildlife is all around us, but it's not always visible. Look at the ground for animal tracks or feathers that can tell the story of animals in that area. Forests can tell us stories as well. Count the rings of a tree to see how old it was. Perhaps there was a fire or flood that left reminders. Challenge children to use their senses. Ask them to close their eyes and tell you what they hear, or smell. Ask them to use their eyes to see patterns in the rocks or cliffs that tell the story of the geology. Learn more about the advantages of getting kids outside at TexasChildreninNature.org.